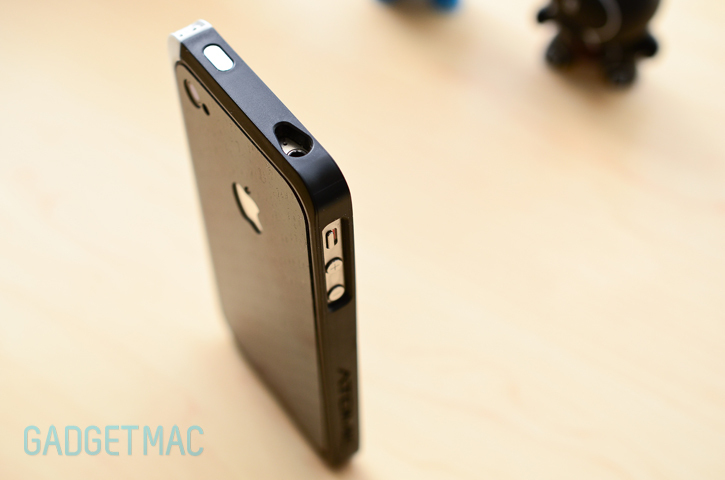 Many great iPhone 4 and iPhone 4S aluminum bumper-style cases have come out over the past year, and we've had the chance to review many of those. Some were really fantasic, and some weren't all that good. Atomic isn't a new kid on the block, but it managed to become a known name when it comes to aluminum cases. Atomic's most notable bumper is the Hybrid C, also known as Hybrid Composite. Fitting both the iPhone 4S and iPhone 4, the Hybrid C is none other than a hybrid of aluminum and composite to bring you the best of both worlds without risking reception. All that's great, but just how well the Hybrid C compares when put against other hybrid rivals? 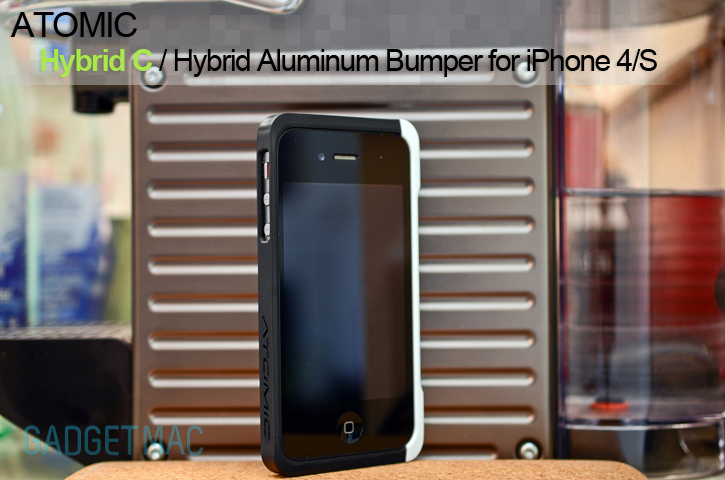 It's the battle of the hybrids, may the best hybrid aluminum bumper win a place on your iPhone right after the jump! Yes we know the Hybrid C has been out for a while now and it isn't the latest and greatest. In fact, it's appropriate to say that it's so last year, but we're giving it a chance. Let's blame Atomic for being so late on us. 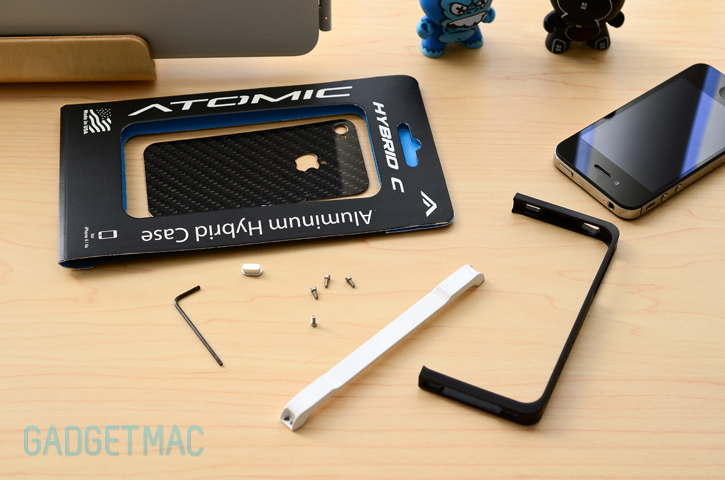 Anyway, as with every single aluminum bumper, Atomic's Hybrid C is made up of two separate parts that are screwed together onto the iPhone using the included hex took and in this case, two hex screws secure the Hybrid C at both ends much if not exactly like the Vapor Comp. Speaking of ElementCase, Atomic has been know for designing its Hybrid C after ElementCase's notorious Vapor which was known to cause reception issues due to its aluminum construction. 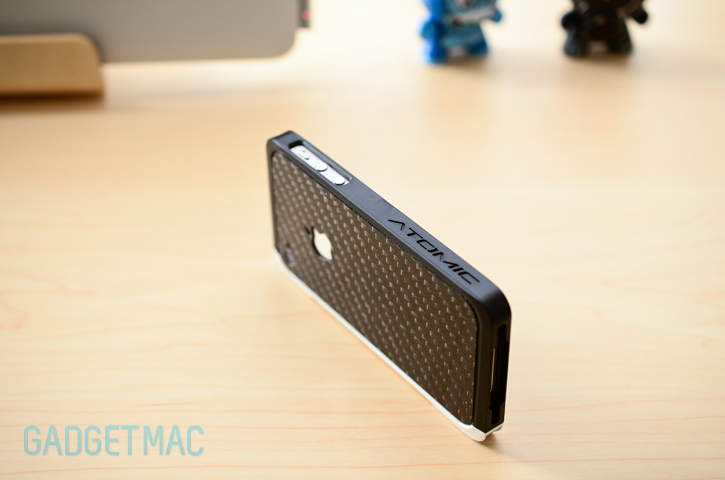 If you cough up $79.99 for the CS32 Superwhite edition of the Hybrid C that we got to review, Atomic throws in a real carbon fiber back skin alongside a screen protector to keep your iPhone's glass protected from all sorts of bad habits. 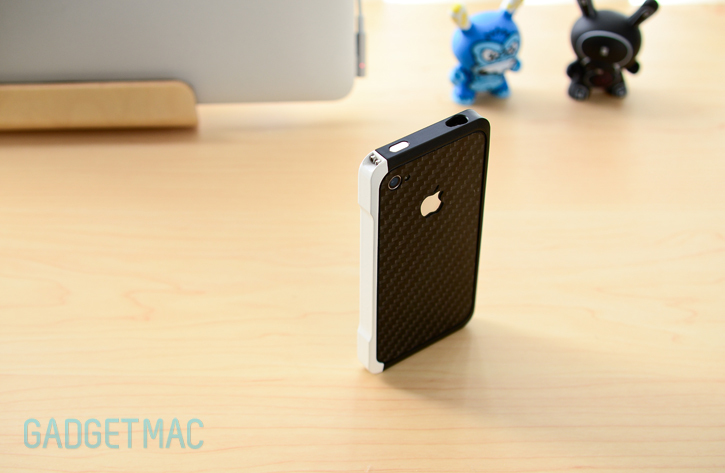 It looks good too, if you're into the whole carbon fiber look that is. Other little add-ons like a machined aluminum button inlay for the sleep/wake button and additional hex screws are also included with every Hybrid C.
What you get for spending $90 on the Hybrid C in the CS32 Superwhite edition is black and white, two-tone color scheme. What we like to call panda style. No one can resist a panda, I mean come on. 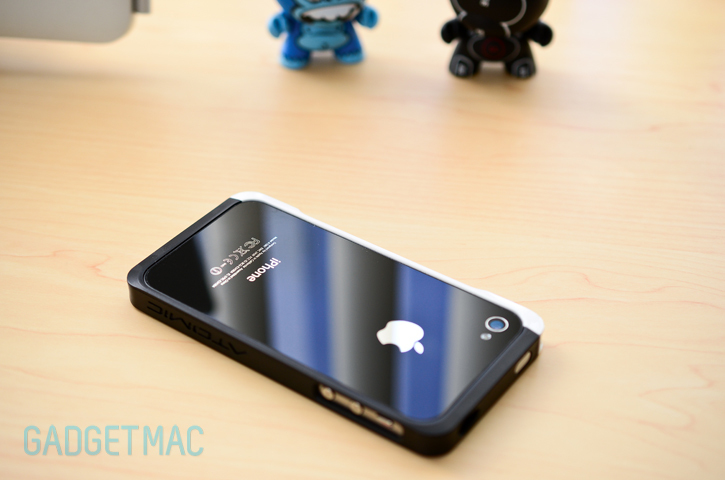 It'll look great whether you've got a white or black iPhone 4/S. But that's not all because the CS32 Superwhite's aluminum white cap undergoes a magnetic powdercoat for a sleek, white gloss finish much like the one found on the limited edition white Draco IV. The Hybrid C also comes in 11 different colored aluminum caps combined with white or black composite pieces at $79.99. Putting the Hybrid C together is a fairly simple and straightforward process. Within a minute you'll be up and running. I must say however, that screwing in four screws using that tiny hex tool never gets any easier. The Atomic logo is embossed in the black composite frame piece and isn't overly in your face even though it's somewhat large. As you can already tell, the included carbon fiber skin has separate cutouts not only for the camera and LED flash, but for the Apple logo as well and for it to show thru to remind others that you're using an iPhone. It doesn't look half bad, but as far the carbon fiber quality, it isn't as nicely finished as the one that ElementCase includes with its bumpers. As far as reception goes, the Hybrid C does not degrade reception whatsoever. That's to be expected out of a hybrid design though. There's very little aluminum here to start with unlike the Vapor Comp which boasts much more aluminum surface than the Hybrid C yet still manages not to degrade signal strength. I'm afraid that it only gets worse from here on end. I felt very uncomfortable holding my iPhone in the hand with the Hybrid C's aggressively sharp edges and oddly shaped corners. Specifically how the aluminum cap was machined. Very little thought was put into making this bumper. The paint finish is so poor that around the edge is a very thin coat which lets the metal show thru. And then there are paces where the powdercoated finish isn't clean and covering the surface evenly. Compared to others, the Hybrid C has the lowest quality finish of all. Definitely not worthy of the asking price. There's absolutely no creativity or sense of design. If you don't mind a simple, blocky design, this might attract you. 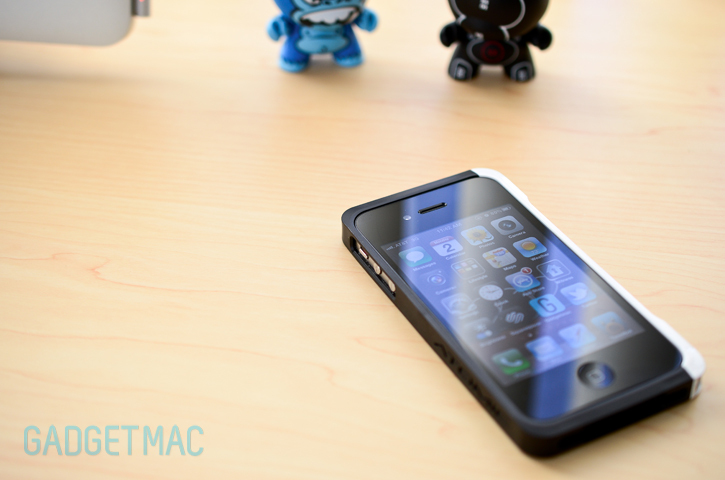 With that being said, there are plenty of simple cases out there that are made right and fairly priced. After so many other great aluminum bumper-style cases that have come out, the Hybrid C looks like the caveman of hybrid aluminum bumpers. It offers little to no grip and very little indulgence and the incentive for those who actually are willing to pay as much for something that isn't just made out of cheap plastic. Otherwise one would pay $30 for a good polycarbonate or hybrid silicone case instead. When put against one of the most incredible aluminum bumpers like the Draco IV, and although both have the same glossy white finish, the Hybrid C's paint finish is considerably of lower quality in comparison. It's much duller and less brilliant. And if you thought the aluminum cap is lined with some form of padding or lining, think again. 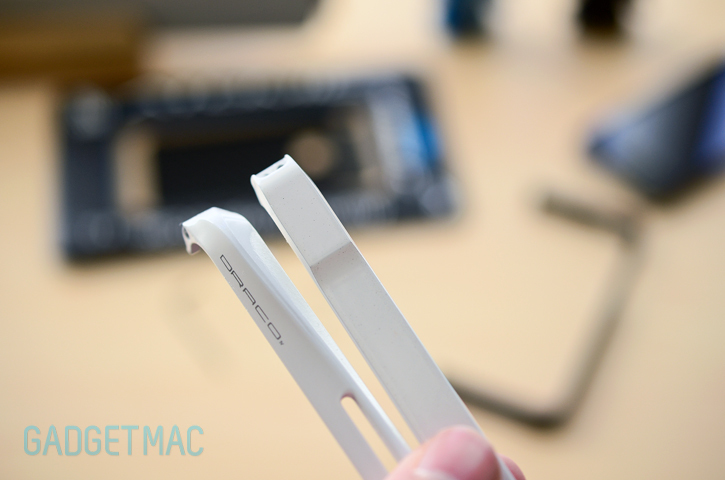 As for the composite frame, it looks and feels like cheap plastic and has injection molded marks. 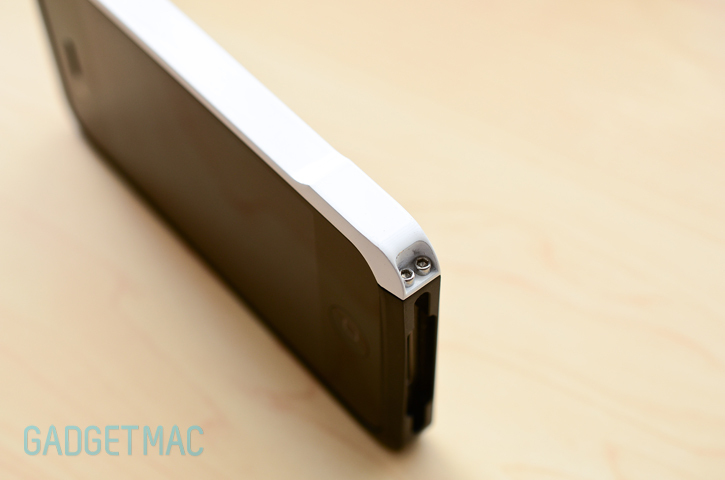 Cutouts are on the tight side and are deeply recessed making it difficult to reach and press the side volume buttons. As for the top integrated button, instead of protruding out it's also slightly recessed for an unknown reason yet it is still pressable. 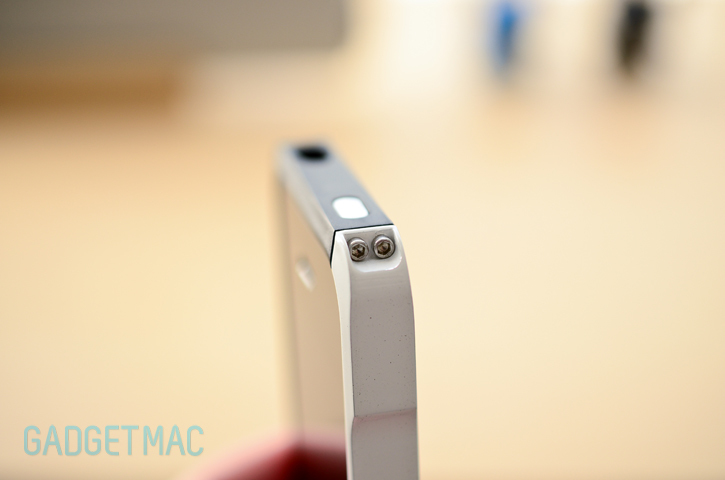 Only the slimmest 3.5mm plugs will fit into your iPhone's headphone port. Same goes for any charging dock connector cable. It's also worth noting that the Hybrid C offers no front or back protection other than a form of scratch protection using a skin and screen protector. However, that makes the Hybrid C to have an extremely slim profile. All in all, the Hybrid C is a letdown for those who pay as much for an aluminum bumper only to get very little in return. Little to no effort was put into the thought of the design with zero attention to detail. There's nothing here that makes us think the Hybrid C is worth consider over other similar offerings. This is a prime example of the quality you'd expect to get when purchasing a knockoff off of eBay. Heck, some knockoffs have better qualities. 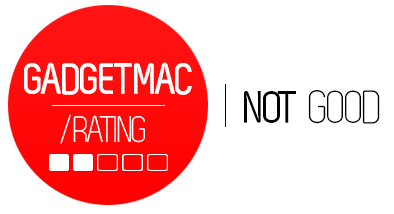 We do recommend however, that you look elsewhere.